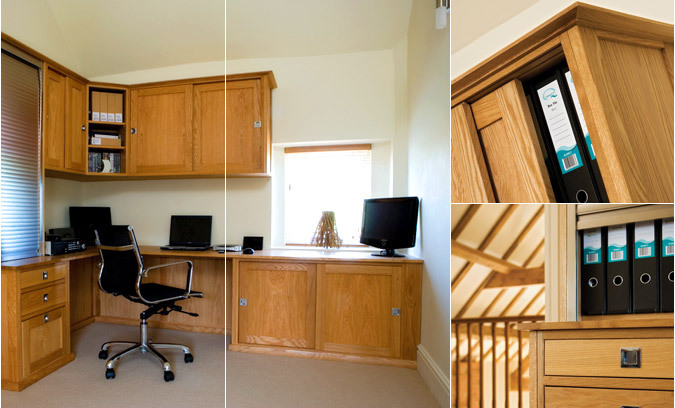 Contemporary or traditional a home office can include whatever you wish, we offer a bespoke service which enables you to organise your space exactly as you would like to. This home office cabinetry is Oak with flat panel doors and stylish pull handles. There is ample space included for files and storage. Cabinetry can be fitted with cable access holes and bespoke pull outs to ensure that computers and electronics are kept tidy but accessible.